Andhra Pradesh NEET Counselling 2018: The Andhra Pradesh Private Medical & Dental Colleges Management’s Association (APMDCMA) is going to start Andhra Pradesh NEET Counselling 2018 for admission to MBBS/BDS course. The online registration form for Convenor Quota, Management Quota, and NRI Quota medical counselling is available on the official website of APMDCMA. Dr. NTR University of Health Sciences has the official authority to conduct MBBS/BDS State Quota Counselling for session 2018-19. According to the notification, 50% of the seats of Convenor Quota (A Category) will be through EAMCET 2018 merit basis, and 35% of the seats of Management Quota (B Category) will be through NEET 2018 merit basis, and 15% of seats are reserved for NRI Quota. 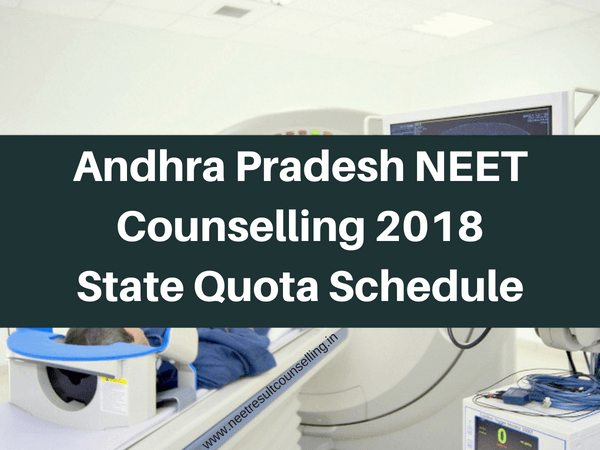 All candidates who have qualified in the NEET Examination 2018 can fill the Andhra Pradesh NEET Counselling Registration from. All colleges affiliated to Dr. NTR University of Health Science, Vijayawada are participating in this counselling. The counselling registration form will be available from 20th to 24th June up to 5:00 PM. The complete counselling schedule is published below. According to the notification, Andhra Pradesh NEET Counselling Application forms through online are invited from the candidates who have secured the cutoff scores in NEET UG – 2018 and fulfilled the eligibility criteria for admission into MBBS/BDS Courses available under competent authority quota in Government, Private Un-aided Non-Minority and Minority Medical and Dental Colleges affiliated to Dr. NTR UHS, Vijayawada and also for MBBS course under SVIMS, Tirupati for the academic year 2018-19. Recently, Dr. NTR UNIVERSITY OF HEALTH SCIENCES: A.P has released the official notification regarding the Andhra Pradesh NEET State Quota Counselling 2018. Candidates scoring equal to or more than this cut-off score have been declared as qualified. Candidate should have completed the age of 17 years by 31st December, 2018. Registration Fee: The Registration and Verification fee of Rs.2,500/-(Bank transaction charges extra)for OC & BC candidates and Rs.2,000/- (Bank transaction charges extra) for SC/ST candidates shall be paid through online by Debit card / Credit card or Net Banking. For technical difficulties Nos. 9490332169, 9030732880, 9502001583 and 8466924522. NCC Quota in NEET 2017? My daughter got state rank of 2695 in au region caste by bc’d’ is there any chance to get seat . Sir my neet rank is 135302 and category b.c.A my marks is 335 any chance to get bds a category seat in andhra pradesh give me your suggestion. when state ranks will be declered? 2. How Many seats are there in Govt Colleges in AP for NRI what is the fee. My brother got 398 marks in NEET 2018 and completed his Intermediate in Telangana state but as per the conditions he comes under Andhra Pradesh as local candidate .unfortunately his rank was not given under APstate ranks but he got state rank in telnagan state.What my doubt is will he be eligible to apply for medcal seat from AP or TS?. If Yes please let me know the procedue. please send the dates of certificate verification .there is no clarity about that.